Deliveroo riders have been ruled self-employed by labour law body the Central Arbitration Committee (CAC). 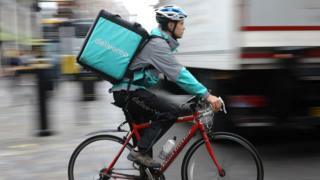 The test case was brought against the delivery company by the Independent Workers Union of Great Britain (IWGB) . The IWGB said the ruling showed a majority of Deliveroo riders wanted workers' rights and union recognition. But the CAC found they were self-employed because of their freedom to "substitute" - allowing other riders to take their place on a job. The case follows a number of claims brought by workers in the "gig" economy demanding rights such as holiday pay, the minimum wage and pensions contributions. Drivers at Uber won a victory a week ago when the company lost an appeal at the Employment Appeal Tribunal against an earlier decision to grant them workers' rights. IWGB brought the case after it had asked Deliveroo to recognise it as a union representing drivers in Camden and Kentish Town and to start collective bargaining over workers' rights. Deliveroo refused and the case was taken to the CAC. The company said its turquoise-and-grey clad "Roomen" and "Roowomen" wanted to keep flexibility of being self-employed. But the IWGB said the ruling showed that Deliveroo riders were not satisfied with their current terms and conditions and wanted worker rights, including holiday pay and the minimum wage. IWGB General Secretary Dr Jason Moyer-Lee said: "It seems that after a series of defeats, finally a so-called gig economy company has found a way to game the system." "On the basis of a new contract introduced by Deliveroo's army of lawyers just weeks before the tribunal hearing, the CAC decided that because a rider can have a mate do a delivery for them, Deliveroo's low paid workers are not entitled to basic protections." Crowley Woodford, employment partner at law firm Ashurst said: "This will be a significant blow to the unions who are trying to expand their membership within the gig economy by challenging the basis on which such employers engage and use their labour." A decision by the CAC can be challenged in the High Court on a point of law. Dan Warne, Managing Director for Deliveroo in the UK and Ireland said: "This is a victory for all riders who have continuously told us that flexibility is what they value most about working with Deliveroo. "As we have consistently argued, our riders value the flexibility that self-employment provides. Riders enjoy being their own boss - having the freedom to choose when and where they work, and riding with other delivery companies at the same time." Deliveroo said it was pushing to have employment law to be changed so it could offer its self-employed riders injury pay and sick pay.